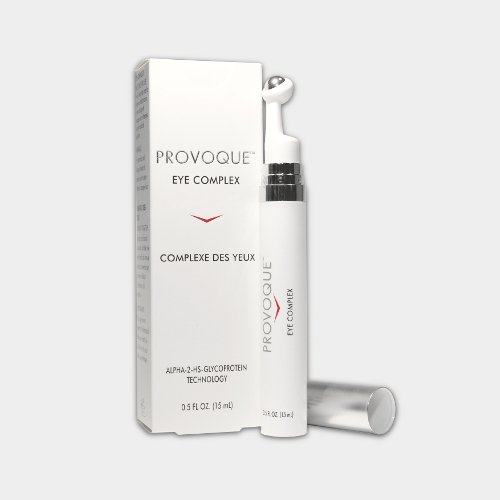 The scientifically formulated PROVOQUETM Eye Complex addresses key signs of aging around and under the eyes. PROVOQUETM Eye Complex is currently available for purchase through authorized physicians. To find a physician carrying PROVOQUETM near you, use our find-a-physician tool. PROVOQUE™ contains the natural secretions of skin progenitor cells, in all their appropriate relative concentrations. The technology utilized in PROVOQUE™ is backed by two clinical evaluations confirming product performance. Bio-measurement assessment of skin hydration showed improvement in as early as 2 weeks with statistically significant results sustained through week 12. The appearance of wrinkles and skin firmness improved in as early as 14 days, with significant results after 56 days. *Data on file, AIVITA Biomedical, Inc. Directions for use: Pump once to dispense a small amount of lotion, use roller ball to apply. Use daily as needed. AIVITA Biomedical is an Irvine, CA based company focused on the advancement of commercial and clinical-stage programs utilizing curative and regenerative medicines. We leverage our unique expertise in stem cell growth and directed, high-purity differentiation to develop safe, efficient and economical manufacturing processes for therapeutic development.